I really, really wanted to like this book. I wanted to like this book much more than I actually did. Sigh. All her life, Juliette felt isolated. It is because of her strange ability to bring intense pain and death to others by means of physical contact. She was locked up and thrown into an asylum after accidentally murdering a little boy. She is dangerous and she must be kept away to ensure the populations' safety, is what they said. 264 days has passed since she had human interaction. It's time for her to rejoin the world. The Reestablishment has decided that Juliette can be used as a weapon in their campaign for total control over our world. Juliette has to make a choice: Be a weapon. Or be a warrior. "Someone picked up the sun and pinned it to the sky again, but every day it hangs a little lower than the day before. It's like a negligent parent who only knows one half of who you are. It never sees how its absence changes people. How different we are in the dark. ""Hope is hugging me, holding me in its arms, wiping away my tears and telling me that today and tomorrow and two days from now I will be just fine and I'm so delirious I actually dare to believe it. "I hate the lackadaisical ennui of a sun too preoccupied with itself to notice the infinite hours we spend in its presence. ""Hate looks like everybody else until it smiles. Until it spins around and lies with lips and teeth carved into semblance of something too passive to punch." Mafi had all these ridiculous metaphors and figurative language. I mean, I'm all for being metaphorical but Mafi just completely went overboard with it. She tried so hard to make it deep and philosophical that it came across as an angsty, emo 12-year old's attempt at writing fiction. The writing just distracted me so much from the actual plot of the story. Oh, and Mafi had this striky thing with the words. I really liked that she used that because it can add something to the text and it's interesting. But Mafi didn't even do it right (see Every You, Every Me by David Levithan). It even seemed like she forgot that she was doing it in the first place. She did it for about 100 pages in (not well, I might add) then stopped. The characters were all flat, unrealistic and too perfect. Juliette was interesting, only at the beginning. Adam did not have any faults. Warner was a crazy, psychotic creep obsessed with the idea of Juliette. He wasn't even a convincing villain because all he did was obsess over Juliette, having meals with her, giving her great clothes and trying to make her fall in love with him. We were mostly told that Warner was evil, instead of being shown that he was. I was actually surprised to hear that quite a number of readers are fond of Warner. They credit his character depth. Whatever. I still think he's creepy. 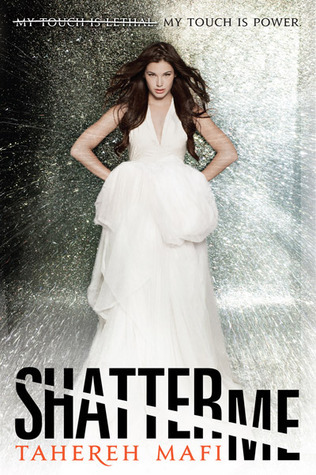 There was full on insta-love in Shatter Me. The author tried to excuse it by saying that Adam and Juliette already knew each other from when they were in 5th grade or something. She said that they were already in love with each other then but didn't say anything to each other because they were both scared and shy. They didn't even know each other at all. See? Full-on insta-love. And that plot. It was really confusing. It was mainly about the love-triangle-that-wasn't-there between Warner, Adam and Juliette. The dystopian part of the novel was a side thing more than anything else. Like, I said. I wanted to like this book much more than I actually did.